Last year I must’ve devoured more Fritos, um, than usual, thanks in great part to the corn chips’ special 75th Anniversary packaging with vintage character art of the Frito Kid. I mean, just look at him. How in the world could I resist?! Looking a lot like the blonde cousin to Bob’s Big Boy and sporting a gigantic wave of hair that resembles (perhaps unintentionally) a great big Frito, to me the Frito Kid is all that and a bag of you know what. 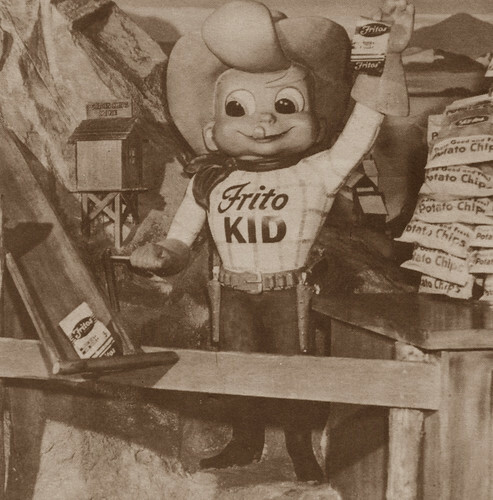 But the name “Frito Kid” would hardly pass our hydrogenated oil-slicked lips today had he not managed to corral himself into a little patch of Walt Disney’s theme park heaven. The first Casa de Fritos location opened on August 19th, 1955 next door to Aunt Jemima's Pancake House. The Frito Kid chip-dispensing machine stood just inside the door as you walked to the counter, and was not visible from outside, which explains why photos are scarce. Here's how it worked. Put a nickel in the cash box on the fence, and the Frito Kid came to life. 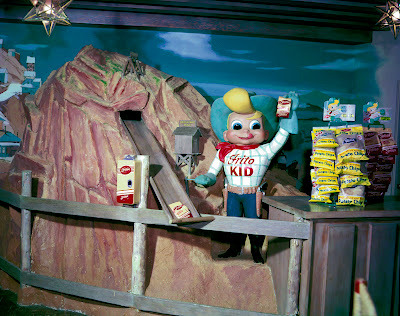 While rolling his eyes, licking his lips, and turning his head, he'd holler back to his unseen partner Klondike inside the mountain to send down some more of those "golden chips of corn," and before you knew it, a wax-paper bag of dee-licious Fritos came sliding out right down the chute. Always heard but never seen, Klondike remains a mystery. What did he look like anyway? 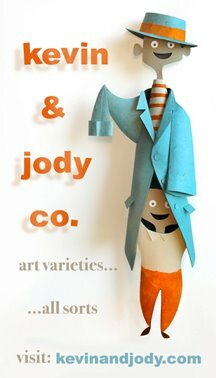 I picture him the Yukon Cornelius-type, while Jody likes to imagine Klondike was a friendly chip-mining bear! 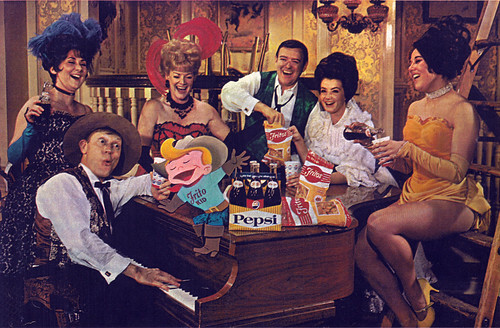 In the 1967 publicity photo below, the Frito Kid is shown whooping it up with the Golden Horsehoe cast. Klondike is nowhere to be seen, naturally, as a bear has no place inside a saloon. "You always expect to find FRITOS, “America’s Favorite Corn Chips,” where there’s GOOD EATING, FUN and EXCITEMENT! Sure enough, you’ll find them in Disneyland, too, along with other delicious food products." I know you'll forgive the redness with a real rarity such as the next photo. 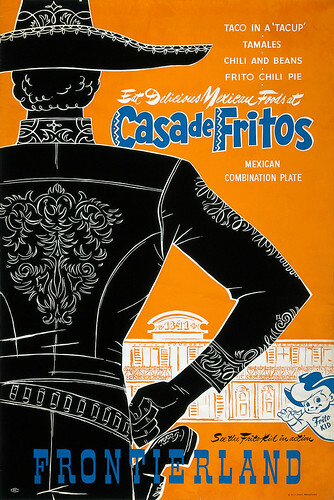 When Casa de Fritos moved to a bigger location on July 1, 1957 (to the one-story adobe structure which became Casa Mexicana - and currently Rancho del Zocalo) the chip dispensing machine was relocated to a fenced-in area just outside the entrance. You can see the Golden Chips Mine and mountain were completely redesigned, and the Kid has been moved to the left of the chute. 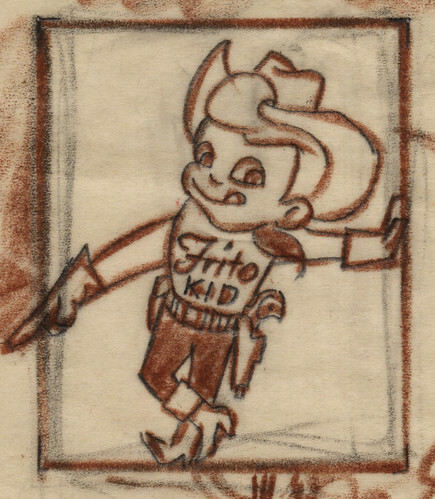 According to a 1955 premium Frito Comic Book, the Frito Kid has a horse. And his horse's name is Maize! 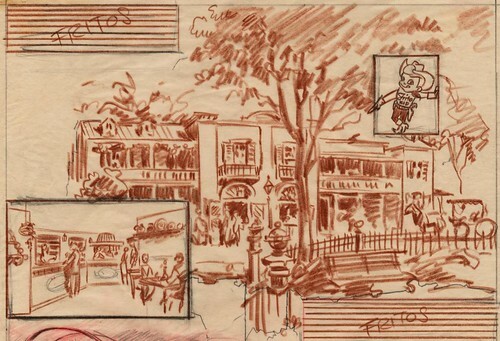 Great post Kevin - hard to find photos of the Frito Kid, and the pencil sketches make this even cooler! A true memory jogger. Beautiful stuff. Thanks Kevin. Thanks for the great visuals! 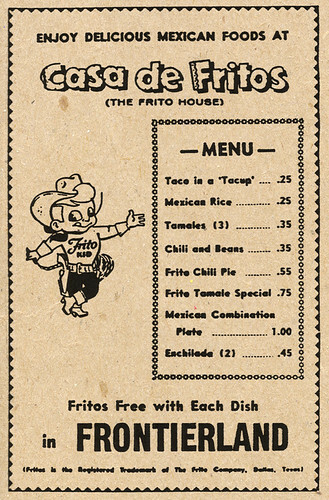 One thing I've never been able to know for sure: was the mechanical Frito Kid vending machine at BOTH locations of Casa de Fritos, or just at the main (1956-1982) location that became Casa Mexicana. Anybody know? Thanks, Pardners, for chipping in! I've revised the post to include more info on differences of the two locations and included an image of the second Frito Kid set-up. Enjoy! There are no limits to the breadth of my knowledge on pointless trivia. Can I do my own taxes? No. CAn I change the oil in my car? Certainly not. Thanks for posting this. My older brothers have been talking about this for the last 40 years, and I was just a little too young to remember it. Although I've seen lots of stuff with the Frito Kid on it, I had never seen a picture of the "Golden Chip Mine" Frito dispenser. Now in future discussions, I can just pretend I remember it. Wow! Great post Kevin. I heard for years about the rareest attraction poster of all, the Casa Mexicana poster, and figured I'd never see one. Then all of the sudden the 50th rolled around and suddenly it's everywhere. On another note, I wasn't around for Frito the kid, but listening to the Disneyland Forever track that was sold, I always pictured Klondike as a bear also. Not exactly sure why, but there was no doubt in my mind that that's what he was, even though that really makes no sense. Was klondike a feature of the commercials or the comic book too? 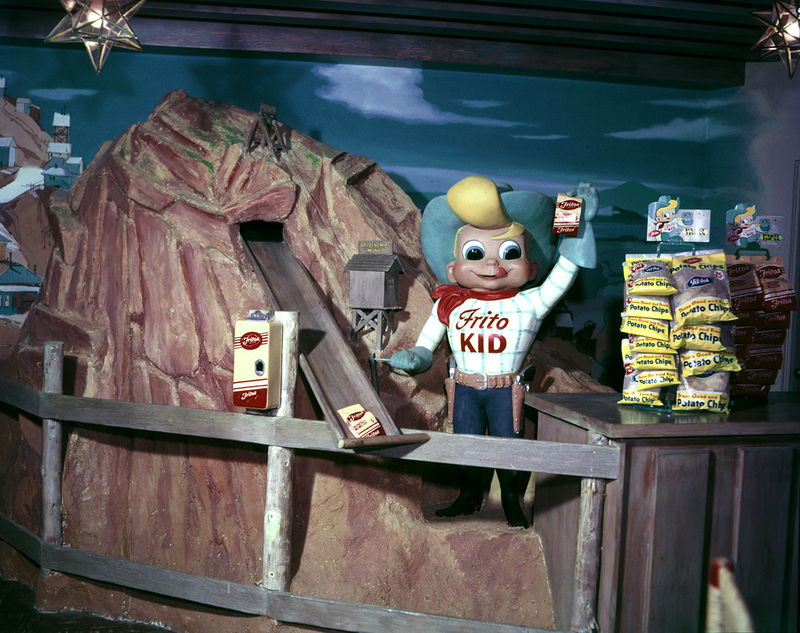 Were there any issues with producing that Frito the kid miniature, what with him not being a Disney owned character? thanks for some truly rare and amazing stuff! Wow, this post is about as spectacular as they come. Tons of great images, and lots of great information. Thanks so much! Your best post yet. Can you say rare images? 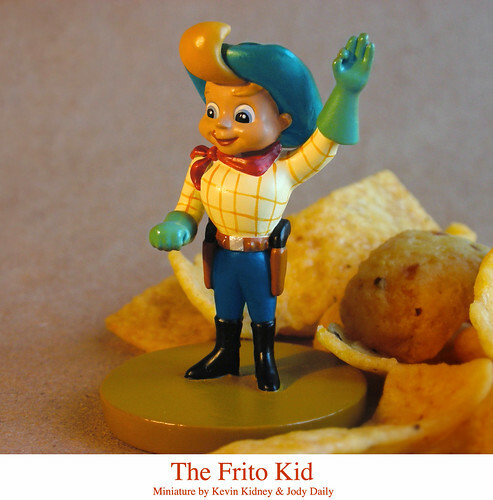 It's fantatic to see photos the 2 versions of the Frito Kid set-up side-by-side. I've NEVER seen the earlier version. LOVE this post! Thank you, Kevin! Absolutely amazing. 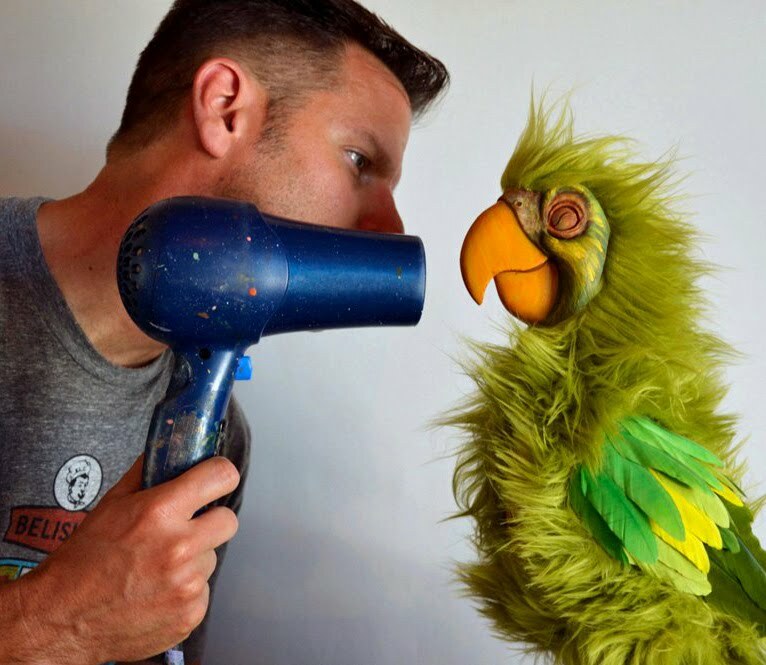 You have done an incredible job of bringing so many of these Disneyland "artifacts" to life for me. "Oh those gold-en, oh those gold-en, oh those gold-en chips of corn..."
What a phenomenal post, and a real memory re- kindler! There must be something to this Klondike-Is-A-Bear thing, because I have also always pictured him that way...something along the lines of the old Icee Bear, though brown (and drawn better!). My Klondike also wears a woolen ski hat and a muffler (it's cold underground! ), so there's a little bit of Yukon Cornelius in there too, I guess, Kevin. Yes, the Frito Kid looks like Big Boy Bob's cousin. But he looks like (Alpha Beta) Alphy's brother! Cowboys (and banditos) sure make great logo characters. This is an older blog, but a GIS turned it up. I found a Frito Kid that was used as a store display. It has a reel to reel tape recorder and the unit lights up. It was good to find a bit of history on the little guy. You know I found this by accident, but I couldn't help but notice the poster looked very familiar. Check out this shirt being sold in Disney World when I was there last week (may 2012). Just came across your piece of The Frito Kid and thought I'd let you know I was as a young boy the prototype for the kid. My dad was the original VP of The Frito Co. (to become Frito-Lay,Inc.) and was head of advertising and had an artist create the image based on me. Incidentally, dad was very helpful in getting funding for Roy and Walt's big dream...Disneyland. 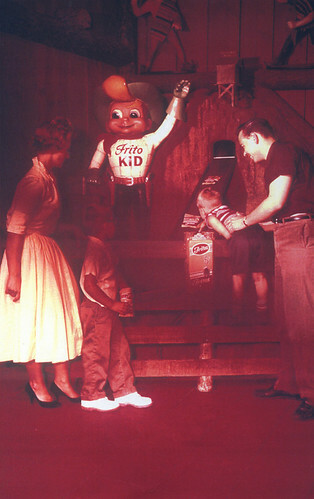 Just came across your blog and thought you might be interested to know I was the prototype for the image of The Frito Kid. My dad was the original VP for The Frito Co. (to become Frito-Lay,Inc.) and he had an artist create the image based on me as a young boy. Dad was also very helpful in helping Walt and Roy the funding needed for their big dream...Disneyland.